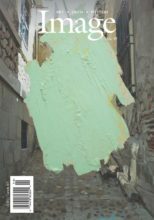 Image is a quarterly journal publishing poetry, fiction, longer essays, interviews, work in translation, and artist profiles. We ask those who wish to query or submit work to read the journal and get an idea of the type and range of material we publish. You can browse our website or order back issues here. Queries can be sent to the relevant section editor, but please click through to Submittable below and read our complete guidelines first. We do accept simultaneous submissions. Please update us right away if work is placed elsewhere. Our current response time runs about four to five months. Upon acceptance, we offer a contract for first serial rights. Upon publication we pay a per-page rate, plus four copies. We do not accept previously published material, including web-published or self-published material. We do not take submissions by email or paper mail. Within Submittable, each category (poetry, fiction, nonfiction, visual art) includes a few genre-specific guidelines. Good Letters is a daily blog publishing short personal and cultural essays. Please browse the blog to get an idea of the kind of content it features. Generally, we look for essays that are concrete and experiential—grounding ideas in people’s lives—and that make a fresh connection between the world of faith and the world of daily life, spanning the gap between theology and experience and giving language a human shape. We don’t publish literary criticism, sermons, or scholarly essays, and we don’t accept previously published material, including web-published or self-published material. Please note that the poems used in the Poetry Friday series are taken from the print journal; that is, we don’t accept Poetry Friday submissions. We do not take submissions by email or mail.